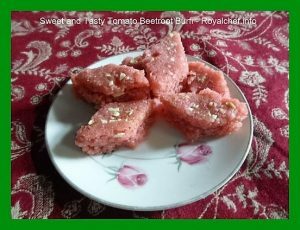 This is a simple to follow Recipe for making at home Sweet and Tasty Tomato Beetroot Burfi or Vadi. This is a specially prepared Maharashtrian Style Burfi, which make the use of Beetroot and Tomato as the main ingredients. The Tomato Beetroot Burfi is a useful snack to have in the house. Boil the Beetroot and Tomato and prepare a paste, grate the Coconut. In a Kadai add the Milk, Coconut and Beetroot Paste and cook it until it become thick. Then add the Sugar and Tomato Puree and mix it well and cook until it become thick or slightly dry. Then add the Cardamom Powder and mix it well. 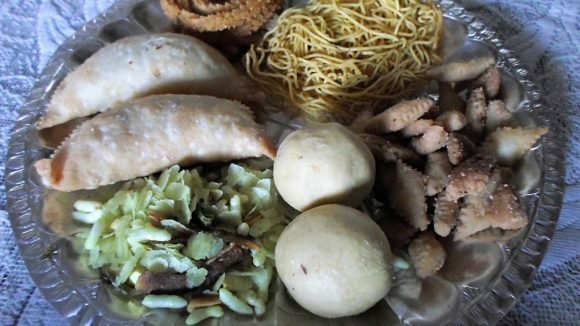 Apply the Ghee over a stainless steel plate and pour the mixture over the plate, pat it evenly and garnish with the crushed Dry Fruits. When the Tomato Beetroot Burfi cools down, cut it into diamond shapes.